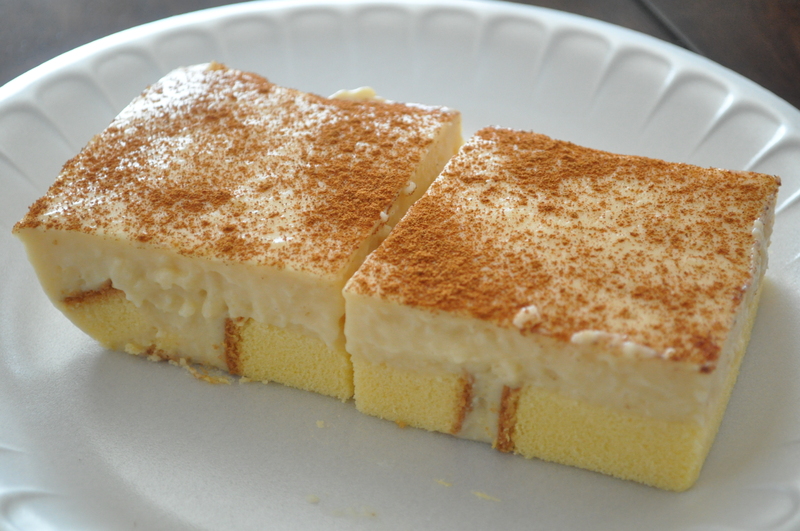 Pronounced ‘la-tee-ja’, this is a classic Chamorro dessert. A light, creamy, custard-like pudding topped with a generous sprinkling of ground cinnamon tops a layer of scrumptious cake. I say ‘custard-like’ only because my version of Latiya contains NO eggs, unlike most of the variations of this recipe. The cake options are endless, but my favorite, by far, is carrot cake, and not just any carrot cake, mind you, but a moist rich version made with carrots (of course), pineapples, raisins, and lots and lots of nuts! Pound cake is another favorite for this, as is another classic Chamorro dessert: Chamorro Cake. The key to assembling this oh-so-yummy dessert is to put lots of space between the pieces of cake. 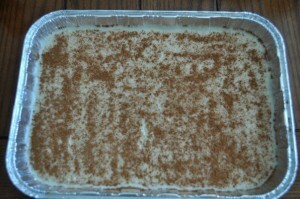 This way, you can pour the creamy latiya topping in between the nooks and crannies. Oh, I’m drooling just thinking about it. If you are a coconut-lover like me, scroll on down for my coconut version of my latiya recipe. The photo below contains my recipe for “regular” Latiya. Click on the thumbnail below to open a full-sized version of the photo to view my recipe. Drumroll please…..and now for my Coconut Latiya Recipe. You don’t want to miss out on this one. In a medium pan, combine the evaporated and coconut milk (reserve the can of water), butter, sugar, vanilla and coconut flakes. Cook over medium heat. Mix the cornstarch with the can of water. When the butter has melted, add the cornstarch/water mixture. Stir constantly with a whisk until the mixture comes to a boil; continue cooking for about a minute longer then immediately pour over pound cake. Sprinkle the top of the latiya with cinnamon then allow to cool. This is a really good recipe and easy to follow. The only thing I’d add is what type of serving dish we should use. I only have a deep glass dish and had to use 2 of those glass dishes to set my Latiya. It took over 8 hours to set, but I just want to leave this comment for any future recipe makers. A shallow tray type dish (like the ones they use at fiestas) would be ideal for this recipe, but not necessary if you’re willing to wait a while for the Latiya to set. If you have a deep dish like me then I’d make this Latiya a day ahead of when you want to serve it . Thank you, Annie, for sharing this delicious recipe. Nice to taste a piece of home! Thanks for the feedback! I do state to use two 9×13 pans, but thanks for your tips for when using other types of pans. I’m glad it worked out! What size pans did you end up using? Thank you so much for sharing this recipe Annie. My grandma loved this cake. It was easy to follow and the ingredients are simple. At least we won’t have to fly all the way over to guam to get delicious food. Thanks again. You’re welcome! I’m glad it got your grandma’s approval! Stop by again soon. Awesome! Thanks for giving my recipes a try. Hi Annie! Are all 3 cans (2-coconut 1-condense milk) all for one cake pan of latiya? Or is this recipe for 2 pans? Pls let me know how many and what size pan I should use. You can make two 9×13 pans with that amount of liquid, plus the water. And it’s evaporated milk, not condensed milk. So for one pan of latiya should I cut recipe in half? Yes, cut it in half. Never mind…I just figured I have to double click on picture! Lol! Annie what are the materials for this dessert? Kyla, the ingredients are in my post. My lantiyas didn’t set right. It’s more liquid than custard. Is there a way I can save it? What can I do? What did I do wrong? Did you bring the mixture to a full boil after adding the corn starch mixture? On the original recipe, to make two 13×9 like your original recipe, if I want to add eggs…do I use 2 or 4 eggs? Well, since I don’t use eggs in my recipe, I can’t tell you for sure. However, for two pans, 4 eggs sounds like it would be enough. Can i use regular milk? And how much should I use? Yes, you can use regular milk. Just substitute the evaporated milk and water mixture with the same amount of regular milk. Hafa Adai my is al I miss guam so much but thanks to your site I can cook all the guam food now… Thank you so much. I made the Latiya and it was great!! I’m so glad I found your website. I do have a question, can I substitute the butter with coconut oil? Thanks! I’m glad you liked it. As for using coconut oil instead of butter, it’ll probably be fine. Just expect it to taste differently, however. It’ll probably taste good if you use coconut oil in my coconut latiya version. Give it a try and let me know how it turns out. How many ounces of evaporated milk? Hi Stephanie. If you go back to my recipe, you will need to click on the photo for the original Latiya to see the size of the evaporated milk. I made the original latiya for a family fiesta that we had over the weekend and it was so much like my grandmother’s, everyone loved it. Question for you, though. My family was pronouncing it na-tee-ya. Have you heard it pronounced this way? Hi Stephanie! I’m glad you like the original version. I only know two versions of the name of this dish: Latiya (used on Guam) and Lantiya (used in the Northern Marianas). I have never heard it called Nantiya. It was Natiya, not Nantiya. Yes, I meant Natiya…that was a typo. A popular dessert dish among Chamorros is latiya. The short answer is : both. To make you more confused, some also say latiyas or natiyas. And in Saipan, they call it lantiyas. The root word is nata, which means milk cream. The condensed milk forms the custard, along with the other ingredients : sugar, eggs, water, vanilla extract, cinnamon and corn starch for thickening. My grandmother made the classic version of latiya when I was growing up and I am so thankful to have found your website so I can make this for my Dad! Thank you! What can be used as a substitute for coconut milk? Jenn, my “classic latiya” uses evaporated milk (mix a can of evaporated milk with a can of water). It’s my coconut latiya recipe that uses coconut milk. Click on the thumbnail of the photo in my recipe above to get my recipe for “Classic Latiya”. Erika, you can make the Latiya topping using Splenda instead instead of sugar. Thank you for sharing….I’ve been using different recipe and can’t wait to try yours, will let you know the outcome. HafaAdai Annie it’s Fred Naputi I’m so taken with your site gof mauleg Chelu! could you please tell me the exact measurement of the coconut milk? i have a 5.6 fl oz and 14 oz can. i wasnt sure. Hi there! Use the 14-oz. can of coconut milk. Do you have any recipe for fried chicken? Hi Margaret, yes, I do. I’ll post it soon. 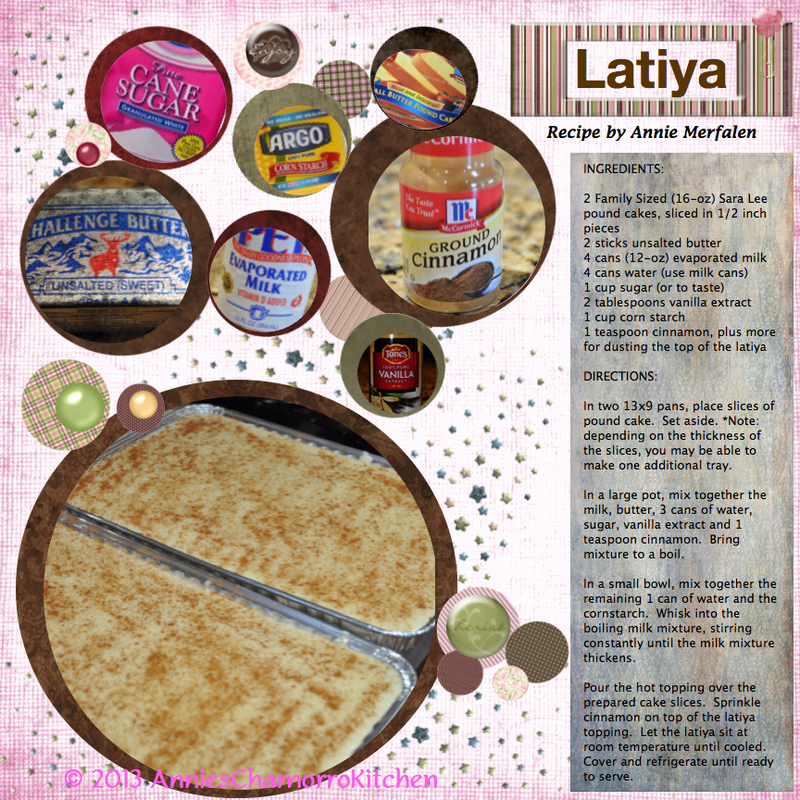 Thank you for sharing your Latiya recipes. I prepared the coconut Latiya and we enjoyed our dessert for the evening. I am excited to try the other Chammorro recipes you are sharing. I am from the outer islands north of Guam and I know for a fact that this is called Lantiyas. Hello Colleen. I do know that the islands of the Northern Marianas call this dish “lantiyas”. On Guam, however, it is called Latiya (without the “n” and “s” at the end). This word, like many other Chamorro words, have different variations on Guam versus the other Mariana islands. In fact, there are some words used in the CNMI that are not used on Guam at all. Thanks for your note, and I look forward to hearing from you again soon! I made the regular latiya with the Sara Lee pound cake. Perfection! Not too sweet!! Thanks Annie!! For bringing my chamorro roots to Texas! !